TKB, Kevin, and I took off Thursday morning and arrived in Anderson, IN around 6:30pm. 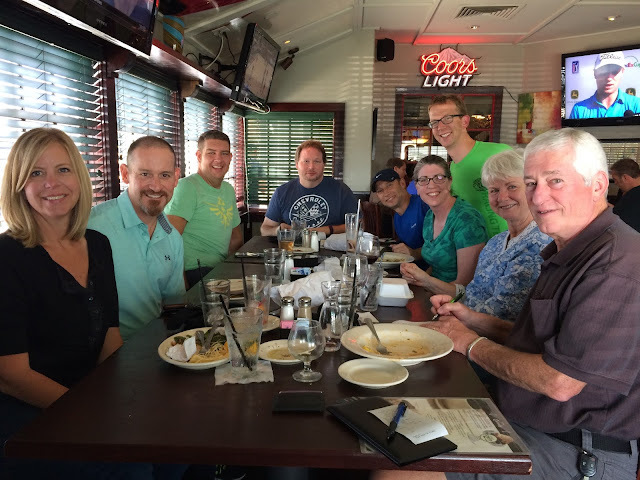 After unloading the car we went into Fisher (suburb of Indianapolis) for dinner at Rockstone Pizza. It's a wonderful place to get stone-fired pizza. If you are reading this to find some good pasta for your Muncie 70.3 experience, they have some great baked pasta options as well. They have a great selection of local craft beer and a friend of Kevin's works there! Corey and his wife Amy arrived a bit later and stayed at a hotel in Muncie, so we didn't meet up Thursday. Erik and his buddy/sherpa, Patrick, were arriving Friday afternoon. Erik is my team runner. Friday we arrived at the race site around 10am. Probably the first 5 athletes we saw were all from KC (Reds Triathlon team, KC Tri, and some folks wearing other local race shirts). Picked up my standard pint glass and the shirt that has all participant names on it in the shape of the M-dot logo on the back. Being a team, I'm not sure if my name was supposed to be on it (versus our team name) but since I had been registered as an individual participant, my name was definitely on it (I couldn't find Erik's). About this time Corey and Amy had arrived. We reviewed the swim area and the transition area then listened to the athlete meeting. We had some questions for the head ref so talked to Rosalyn for a little bit. One concern I had was the fact that relays were the last wave. That meant that I would be one of the final 25 people to hit the bike course. Yes, I literally told the ref "I don't want to sound cocky, but I'm going to be passing a bunch of people." Frankly, my concern was I would be spending a lot of time on the left side of the lane because I would have 1,800 cyclists in front of me with a two loop course. She didn't give me the best feeling but had to go with it. Rosalyn was pretty great as she told us some stories of some horrible participants in previous races. Kevin, Corey, and I then headed out for a shake-out bike ride which proved quite beneficial for all of us. Corey was having some malfunctions with his bike computer and this solidified his plan to just use his Forerunner on the bike. Kevin found out his rear brake didn't work! The brake was loose from its attachment to the bike and the techs were able to fix it. What did I learn? My previous single practice of doing a flying mount on my bike wasn't enough. I pretty much embarrassed myself trying to do so Friday, as well as managed to scratch up my right thigh and causing my right heel to be sore the rest of the day. Erik and Patrick then arrived we made it through the packet pick up process. Erik and I walked through the transition setup now that we were able to get in and review the relay boxes. By this time it was four o'clock and we had figured out dinner plans and headed out to for a pasta place once TKBs parents arrived. After dinner we finished prepping our bikes/gear and off to bed with a 3:30am alarm. We wanted to get there close to after the transition opened plus there was a 30 minute drive to the race site. Fortunately, Erik and Kevin both share my propensity for having time on my side and not the other way around. Even though the race offered Friday bike checkin, we elected not to have to deal with bike pumps and other worries, so we brought our bikes on Saturday. It was nice knowing we didn't have to worry about rack placement since each spot was individually numbered. Nice and tidy. Only thing missing are running shoes, visor, bib. I got my spot setup and then headed over to Kevin's and gave him some advice on transition. We went over to Corey's spot but he wasn't to be found but he was all setup. He was one of those lucky few with the first spot on the rack. We took off for the first of many bathroom trips and then off for a warm-up swim, which opened at 6:45. My wave was scheduled for 7:48 but no one I talked to knew when the swim area closed, so I hopped in the swim practice with Kevin and Corey, who were in the third wave. As I was getting ready to get in the water, I ran into another KC Triathlete who works at the local Ultramax store. I've talked to her a few times before as I stopped into the store. She mentioned that the swim area would remain open so I just did a short swim. We all agreed that the pre-race warm up was a good idea. It helped calm the nerves and get the body ready to go. It was soon ready for Kevin and Corey to go to the start corral. 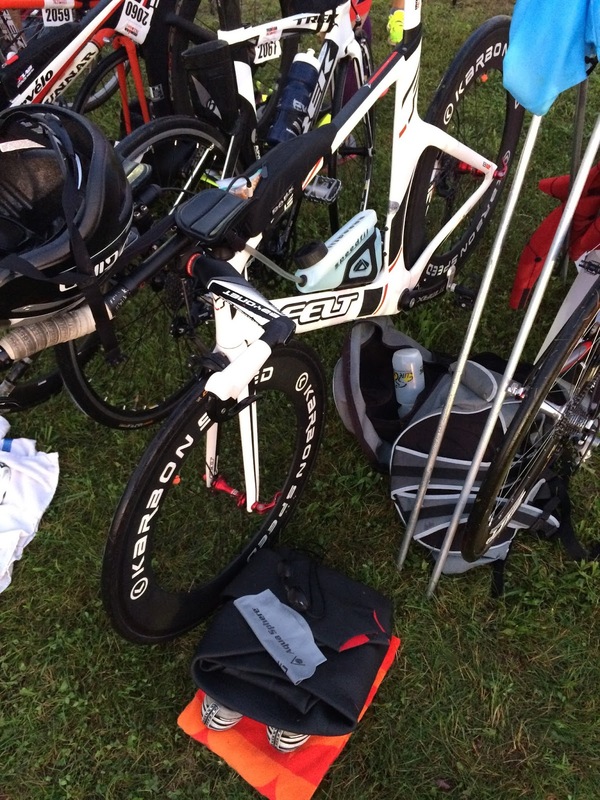 It was the start of a big new experience for both since it was their first half ironman. I was hoping they would both enjoy endurance triathlon as much as I do. Now that they were off, I was still within myself. My nerves were still pretty high considering this was my first race of the year and, frankly, my last. 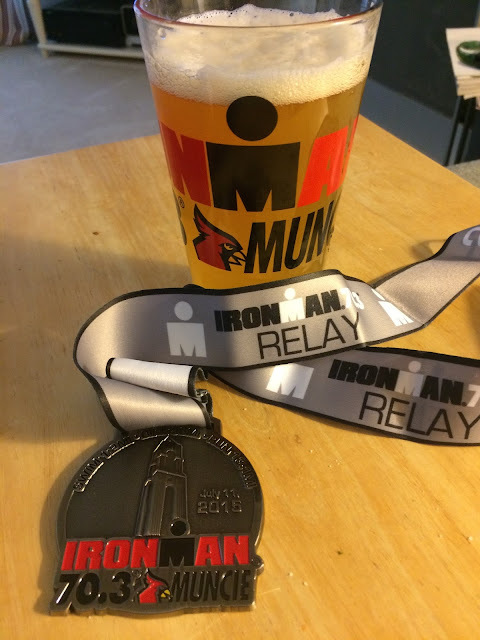 I've done two half ironmans before, so I knew what I needed to do. Part of it was some frustrations that I couldn't do the run and so it was just going to feel somewhat incomplete. Don't get me wrong, I am thrilled to be able to compete and that wouldn't be possibly without Erik and I'm totally grateful for that! I decided to make another trip to the porta-potty and I'm glad I did. I may have gained 5 watts on that restroom trip (if you don't know what that means, just move along). I then put the wetsuit back on and did a few laps of the warm-up area. As I watched the first swimmer exist, I noticed the last buoy had a number "8" on it. Good information to know, since all buoys were numbered. 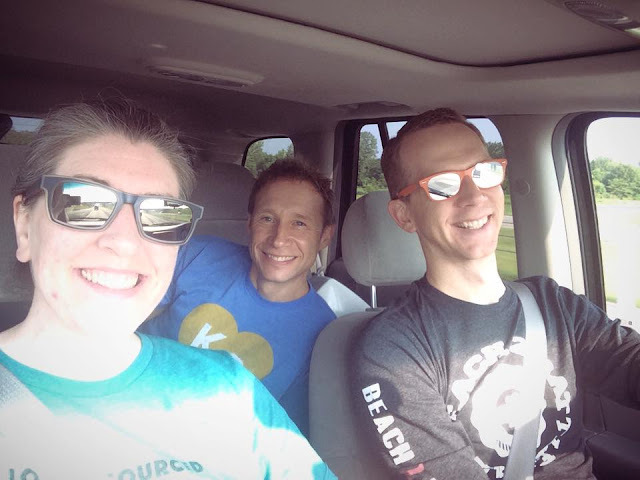 After saying goodbye to TKB, Erik, Patrick, and Amy, I was off to join the final wave of relays, about 25 of us. Joyce from Ultramax was with the relays as she had a similar story to mine. She was going to do it as an individual but injured her hand in a fall, so was doing this as a team of 3. I also met another KC triathlete while wading in the water. Considering it was only 25 of us, we had plenty of room to line up. At 8:03 (race was delayed 15 minutes due to parking problems), we were off! I immediately got in a groove and felt great. Having all that room was awesome. Even though the previous two waves were the young gun females and males, I knew that room wouldn't last. About buoy number four, that ended as I started swimming with the previous wave. I felt like I was doing pretty good with my line. The buoys were huge and so I could spot them easily. Swimming westwardly definitely helped with the sun behind us. Turn one was crowded but I manage to hit turn in open space on the turn but the washing machine was now in full effect. I will say that being in the last wave was great. If anyone was going to pass me, it had been done as we started. There was no wave behind me to have people catch me. I was passing a bunch of people and seeing people in three to four waves in front of me. It's always a confidence booster. I hit turn 2 with a bunch of people and was happy to start counting up to buoy number 8 (the numbers restarted halfway through the swim). I was still feeling in a groove but I noticed my left arm was getting sore. When I put my wetsuit back on, I remember working on the left sleeve quite a bit and so might have put it on so it strained my left arm movement more than usual. I passed buoy number 8 and just kept swimming until I felt ground. Got up and took off! This race had wetsuit strippers and so I sought out a couple people after pulling my suit down to my waist. It took them a bit more time than I had hoped but still faster than by myself. I then took off running the quarter mile to my bike. Throw my wetsuit down by my bike, put on my sunglasses, helmet and shoes and then off! My validation to not doing a flying mount was validated as there was no room with about 6 people spread about the mount line. I quickly got on my bike, clipped in, and took off! My fear about the bike course was quickly realized as people were all over the road. I passed as within rules and within common sense as possible but there were multiple pelotons in action. The quality of the roads in the first 7 miles weren't that great but no issues on my part. The course reached out to State Route 35 and did two loops before heading back in. My heart rate was pretty escalated for the first 10 miles as I was trying to get into open space. My wattage averaged the zone I was hoping for but I was burning some matches trying to get around the groups of people. I felt happy with my pace around 22 - 24 mph but I didn't have a run to worry about. They had four aid stations on the course. 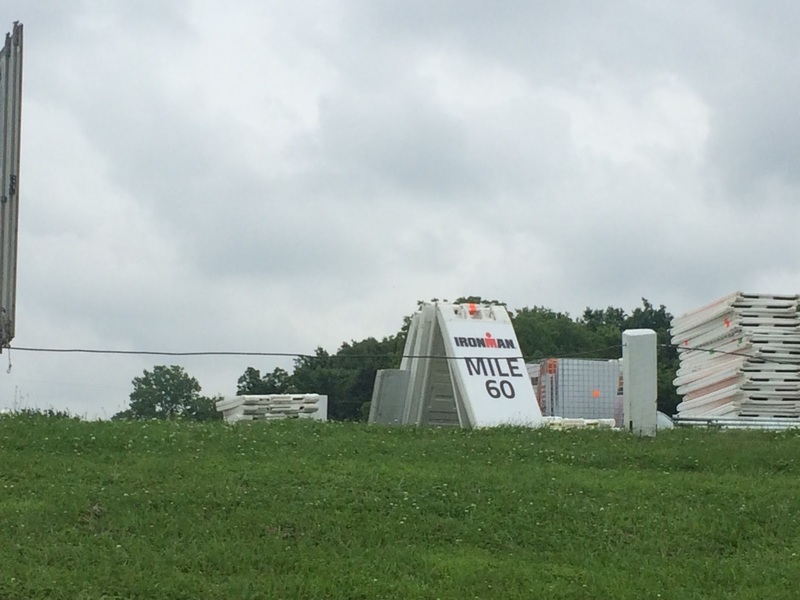 I've been in races with aid stations but those races had plenty of room on both sides of the road. The roads here were two lane with no shoulder, so it was a tight squeeze. The route had some elevation gain but no huge hills, especially compared to what we see in Kansas City. You'd find yourself working hard and then you'd realize it was because you were on an incline. I didn't keep track but had about 5 or 6 people pass me total and most to those were race leaders on their second lap of the bike course. I did play leap frog with a couple people and that was a little frustrating. For one thing, I don't like to play leap frog with the same people over and over and two, they were definitely drafting off of each other. One was drafting off me for about a minute when I finally got done with it and pushed on. I should have left him there for a ref to see him and save me from burning another match. I tried to stay within my wattage zone and felt I was doing a pretty good job of it but I knew eventually my time would come to hammer. Not having to run meant not needing to conserve energy. Don't get me wrong, I was't holding back that much from the first mile but still wanted to pace myself. I had been using my nutrition plan quite well so I had decent energy. My finicky hip was cranky but I knew I wouldn't hurt it. My right leg was also sore at a few spots that made me question the healing of my stress fracture but the biggest concern was on my calf. I attributed this to riding in my triathlon shoes instead of my road shoes that I normally use. I should have stuck with my road shoes since I decided to not do a flying mount. About 10 miles to go, it was time to time trial to the end. Not sure why I chose 10 miles out as my time to hammer but it was similar distance to the downtown time trials that I have done in the past. Not too long before this point, the couple guys who were playing the drafting game had past me again. Now I had some fun flying by them at 29 mph and hoping I'd sweep them up trying to catch up with me not realizing I was done in 10 miles. My miles 45 - 50 average 25.7 mph, which was a nice flat and open road but last split was slower at 22 but also had hills, turns, and "traffic" to it. So miles 45 - 55 were in 25 minutes, 15 seconds. My last split included some of my transition, so I don't have a good split of my last mile. I do enjoy the bike! I had the 3rd fastest relay split and so we moved up to 4th place. Sometimes you have that perfect day and sometimes you have that perfect day with something that annoys the crap out of you. Today was the latter. 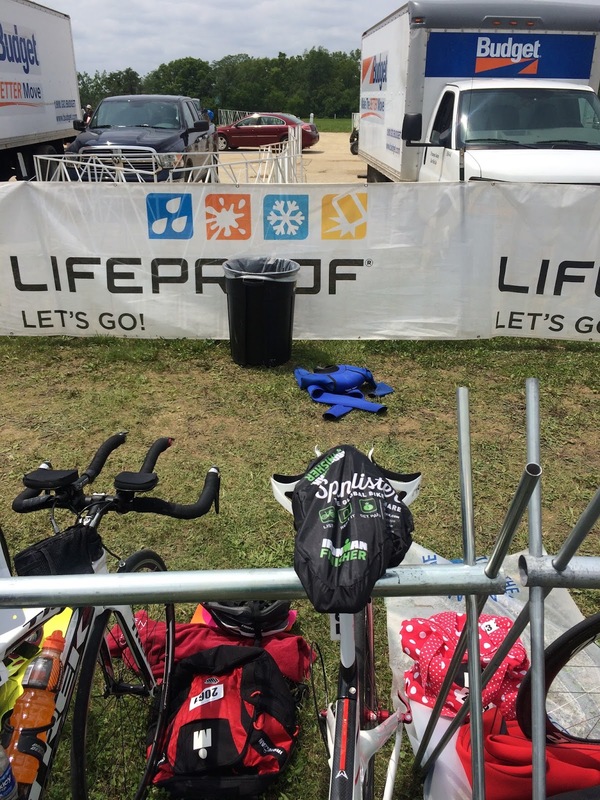 I ran to my transition spot to put my bike on my rack and, boom, some idiot draped their wetsuit over my spot. I simply racked my bike on it and started taking off when I hear a crash and turn back. My bike fell off the spot because of the wetsuit and some official yelled at me that I can't leave my bike like that. I agreed (even though I'd be back in a minute to fix it anyway) and ran back, grabbed the wetsuit and told the official that this wetsuit wasn't mine and I threw it and re-racked my bike and took off.... again. Erik saw me running up, kneeled down and pulled off my chip, placed on his leg, high five and took off! Seeing Erik take off made me happy to have him on my team. Erik has had an amazing weight loss story the last few years and enjoy participating in races with him and love having him on my team. I anxiously awaited Erik to arrive and watch him run through the finish chute. As soon as he came through we high fived again and I ran around the finish line to see him out the chute. Erik killed that run with a half marathon PR! Let's back up. After Erik took off I found TKB, Amy, and Patrick. We walked around a bit and got to see the first two male finishers cross the line. I had left a few things at my transition that I wanted to have with me, so I walked back to my bike and cleaned it up a little bit more and had it essentially ready to go. I saw Joyce again and chatted about her swim while she waited for her cyclist to come in. I then went over to get some food that was set aside for athletes while Erik, TKB, and Patrick bought some lunch. After finishing my plate, I decided a trip to the bathroom was in order. Apparently while I was off, Jason Parr who I raced with at Pigman Tri in 2013 had just finished. TKB went over to say hi and then I did too after I got back. I went looking for him but when I came back to the finish chute there was TKB, Amy, Patrick... and Kevin! He had just finished and we missed it! I was so bummed but I blame him for it... because he rocked his race! He finished in 5 hours and 17 minutes! Based on what he thought he'd finish, we didn't expect him in that soon. We walked around a bit and then went a bit further down the run course to see Corey and Erik arrive. Not too much longer and Corey came flying down to finish in 6 hours and 1 minute Another amazing finish for a first timer (just a few minutes past my first half ironman). 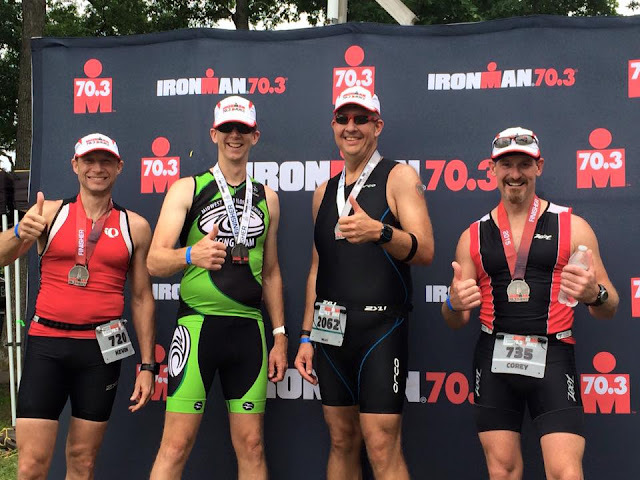 These guys seriously did amazing for the first half ironman and was happy to be apart of it. Looking forward to doing a lot more races with them! Definitely had a good experience at Ironman 70.3 Muncie. Good post-race experience with athlete food options (quarter chicken, applesauce, cole slaw, veggie burger, and pop). Plenty of race merch to purchase. On the non-race day side, I was able to easily get a refund when I registered as a team. I was a little annoyed that I couldn't run through the chute with Erik at the end. I will say that considering the size of roads we are riding on, there were way too many people on the bike and borderline unsafe. Not many races in the world offer a completely closed bike course like Muncie and so I doubt they would be able to do that with wider roads. I'd definitely consider doing this race again. As for our place, we finished 7th out of 21 teams (1st of the three Kansas City teams ;)) with a finish of 5:34:11. Just put that right back in the truck, please. Don't put your wetsuit on my rack. This is where you will find it. 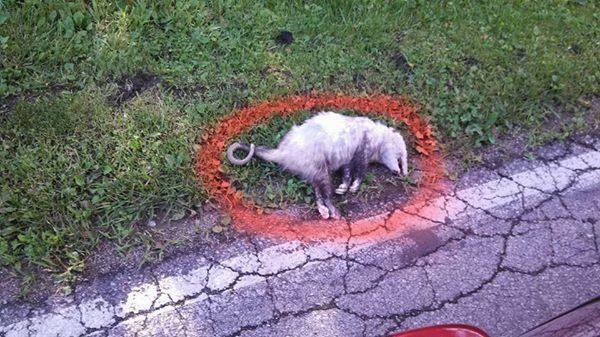 Someone commented that the road crew marking the bike route for potholes wanted to ensure no one harmed this sleeping rodent. We got caught leaving the scene of the race.